Bridge aside, this is one of the best-sounding - and looking - Jags around. Silky-feeling neck. Nitro finish looks great. Will need a new bridge before you can play live. The Jaguar has never been one of Fender's most popular creations. Launched in 1962 and discontinued in 1975, this offset oddball didn't earn its cool points until Kurt Cobain, Kevin Shields and John Frusciante picked it up in the 90s. Since the model's reissue in 1999, the Jaguar has appeared across most of Fender's lines, and now the company's given it a proper nitrocellulose lacquer. Now, nitrocellulose lacquers are what Fender used back in the day. There's just something about the look, feel and even the smell of a nitro finish, and it wears dings and scratches well, too. 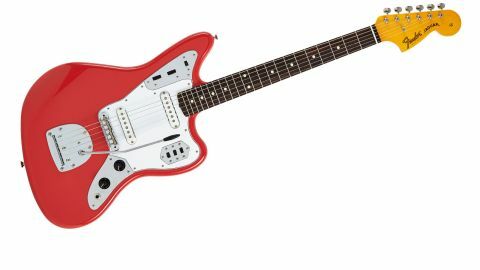 "For anyone seeking a vintage-spec Jag that won't break the bank, this is what you've been waiting for"
Fender has been rolling the lacquers out to its Mexican-made guitars since 2013, starting with Strats and Teles, and this year, it's the turn of the Jazzmaster and Jaguar. The finish looks gloriously 50s and feels rather glossy to the touch, but it will calm down over the years. Yes, there's only one finish available, but when it's a Frusciante '62-aping Fiesta Red, we're not complaining. We make no bones about the American Vintage '65 single coils, either, which come straight from the high-end model of the same name. What might cause consternation is the original Jaguar bridge, which features saddle grooves too shallow to keep strings securely in place - the low E tends to pop out when bending high up or hitting the strings hard. Fender usually equips modern offsets with Adjusto-Matic or Mustang bridges, which have deeper grooves, and while we understand the desire for 60s authenticity, we'd fit a new bridge before we played this live. It's a shame, as everywhere else this Jag is pure class. The short 610mm (24-inch) scale makes for comfortable add9 chords and bends, while the nitro-finished neck gives you a slightly silkier feel than the usual gloss urethane. Then there's the massive array of tones. The Jaguar's switching has foxed many over the years, so here's a quick reminder. You get two circuits: rhythm and lead, each with a volume and tone, but the lead circuit has three extra switches to turn the neck and bridge pickups on and off, and activate a high-pass filter. But don't switch both pickups off or you'll mute the guitar entirely! Engaging only the neck yields some of the sweetest cleans you'll ever hear, with a non-invasive high-end that's ripe for arpeggios and shimmering chords. Switching to the bridge yields a thinner, more cutting tone - especially with the high-pass filter engaged - for Bond and surf-style bottom-string leads, especially with a touch of the smooth-riding vibrato. The overly dark rhythm circuit, which engages the neck pickup only and drops the high-end, is less usable, but add some amp gain or ripping fuzz, and QOTSA riffage abounds. For anyone seeking a vintage-spec Jag that won't break the bank, this is what you've been waiting for. However, if you're looking for a road-worthy Jag, we'd advise you look towards the Classic Player Special and its Adjusto-Matic bridge.